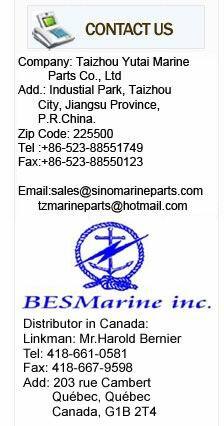 万丰国际点击部，万丰国际官网，万丰国际客服热线电话Taizhou Yutai Marine Parts Co., Ltd is a group of Marine Instrument, Marine valve, marine Parts, etc. in Mainland China. Our main products include Marine pneumatic quick-closing valves, ANSI/JIS/DIN marine valves, UQK-01/02/03, UQK-65,UQK-65-C/S level controller, UHZ-511/512/515 level gauge, YSZK series marine pressure sensor, etc, marine parts from P.R. China. We’ve formed a complete quality guaranteed ISO 9000 system with advanced physical and chemical testing means and equipments for inspection.